I will leave early to avoid the danger. I will make a plan, defend my home and survive. 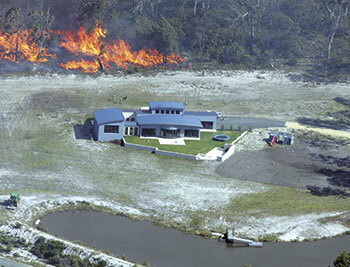 Your home is more likely to survive a bushfire if you have prepared it properly. The most important job is to create a defendable space, an area around your home where you have modified the vegetation and removed most flammable material to reduce the fire's radiant heat intensity. Flames and radiant heat from an approaching bushfire will be reduced, so sparks and embers will have less fuel to ignite when they land, and any spot fires will be easier to put out. A defendable space makes it much easier to defend your home. And if you choose not to stay, a defendable space will help firefighters protect your home, or may even protect your home if firefighters cannot reach it. Tasmania Fire Service recommends that you should not plan to defend your home when the Fire Danger Rating exceeds 50 (severe) in your area unless you have created a defendable space and ember-proofed your home. 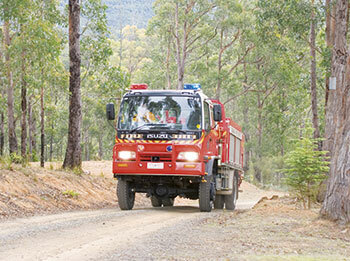 Once a defendable space has been created, it needs to be maintained in a bushfire ready state all year round. An inner zone where flammable materials are minimised. An outer zone where a low level of flammable material is permitted. In the inner zone, flammable materials on, under and around your home should be moved away from the house. Use the guide below to work out the distance you need to apply. Include non-flammable areas such as paths, driveways, and mowed lawns. Use non-flammable mulch, do not use woodchips or bark. 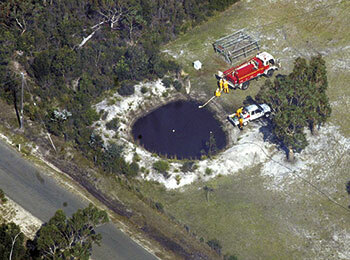 Locate any dams, orchards, vegetable gardens and any effluent disposal areas on the fire-prone side of the home. Use radiation shields and windbreaks such as stone or metal fences and hedges using low-flammability plants. 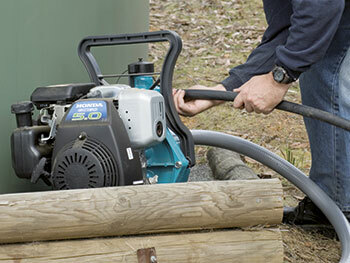 Remove fire hazards such as wood piles, rubbish heaps and stored fuels. Prune lower branches on trees and remove flammable shrubs from under and between trees. Rake up bark and leaves and keep roofs and gutters clear of flammable debris. It is not necessary to remove all vegetation from the inner zone. 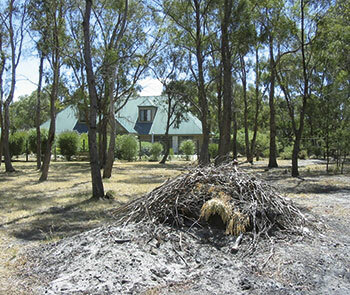 Individual trees rarely cause houses to burn in bushfires. And trees can screen a building from windblown embers while protecting it from radiant heat. Smooth barked trees are less likely to catch fire than those with rough bark. No tree should be able to fall on the home. In the outer zone, small-sized natural fuels (such as leaf litter, bark, sticks, tussocks and some shrubs) should be removed and larger fuels (trees and shrubs) should be cut back to reduce the intensity of an approaching bushfire. Natural fuels, both on the ground and between the ground and any larger trees, should be reduced by selective removal of vegetation, both horizontally and vertically, followed by ongoing maintenance. Retain established trees to trap embers and reduce wind speeds. Selectively remove small trees and shrubs to create clumps (rather than a continuous wall of trees) separated by open areas. Remove the vegetation between the ground and the bottom of the tree canopy, to a height of at least two metres. Minimise fine fuels at ground level, such as grasses and leaf litter. There is no need to remove most trees as they can be beneficial in trapping embers and reducing wind speeds, and will not be involved in a bushfire once the fuels on the ground and the understorey have been modified. Effective landscaping design should provide for safety while retaining a pleasant environment. The final impression from a distance is that all the vegetation has been retained, while up close the impression is of more open vegetation. If you plan to remove bushfire fuels by burning them during a Fire Permit Period, you may need a permit issued by a Fire Permit Officer (call 1800 000 699). If it is a Non Fire Permit Period, contact your local council for information about local restrictions. At all times register your fire by freecalling 1800 000 699. You need to make sure your home is protected against 'ember attack'. Embers will build up on horizontal surfaces, particularly in corners. They can enter your home through small gaps around window and door frames, eaves, cladding and roofing. Timber decks can be ignited, particularly if embers can build up beneath them. Small gaps should be sealed with protection strips or non- combustible filler, and larger under-deck areas should be protected with non-flammable screens. Measures to ember-proof your home should be taken well before the beginning of summer. For more information about how to prepare yourself and your home for a bushfire, read the Tasmania Fire Service brochures Using Fire Outdoors, Fire Resisting Garden Plants, Bushfire Survival Plan and watch the video Bushfire: Prepare to Survive. In some cases, firefighters may be able to help you defend your home. If your home is set back from the road and a fire truck needs to use your driveway, it should have a minimum width of 4 metres, clear to a height of 4 metres. 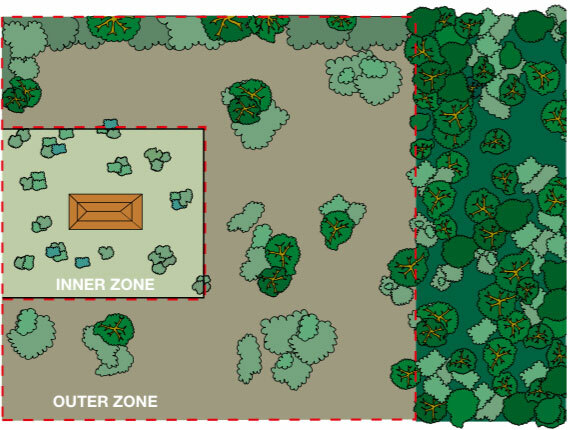 Any bush 2 metres either side of the driveway should be cleared as for the outer zone. The inner radius of any turns should be no less than 10 metres, and there should be adequate room at the end of the driveway for a fire truck to turn around. Whether you are staying to protect your home or leaving early, it is essential to have water available. Firefighters might need it even if you are not there. Putting water on fires that threaten your home is the best way to extinguish them. However, during a bushfire, mains water pressure may drop or fail altogether. Consider alternative water sources such as a nearby pond or dam, creek, swimming pool or water tank. The Tasmania Fire Service estimates that if you are relying on one of these alternative water supplies, in the most intense bushfires you may need up to 10,000 litres or 2,500 gallons of water to defend your home. You should make it accessible by fire trucks, and it is advisable to have a male 50mm Stortz coupling (the old 64mm 5V thread is still in use and acceptable) fitted to the base of your water tanks to allow for direct connection by firefighters. If staying and you rely on one of these alternative water supplies and an electric pump, this will be useless if power supplies are interrupted - a generator or a diesel or petrol-powered pump is an important backup. Pumps can be heavy, so consider mounting the pump on a trolley to make it easier to move around. It is important that all those likely to stay and defend your property know how to start and operate the pump. Caution: Petrol-powered pumps and generators are suitable if they are shielded from high ambient temperature, which is likely to cause petrol in the carburettor to vaporise and the engine to stall. Petrol engines in above or below-ground insulated boxes and well-ventilated under-floor spaces may continue to operate effectively. Plastic tanks and pipes melt. Plastic tanks, exposed plastic pipes, fittings and hoses may melt in the heat of a fire - just when you need them the most. Install steel or concrete tanks. If installing a plastic tank, ensure it is at least 30 metres from the bush, and not too close to any other fuels such as a woodpile, shed, shrubs and other flammable fuels. Bury any plastic pipes (PVC and poly pipes) at least 30 centimetres underground. By SMS relay – text 0423 677 767.